How to derive the formula to find the n-th term of a geometric sequence and and use the formula to find another term of the sequence? How to find the sum of a finite or infinite geometric series? The following diagrams show the formulas for Geometric Sequence and the sum of finite and infinite Geometric Series. Scroll down the page for more examples and solutions for Geometric Sequences and Geometric Series. This video gives the definition of a geometric sequence and go through 4 examples, determining if each qualifies as a geometric sequence or not! 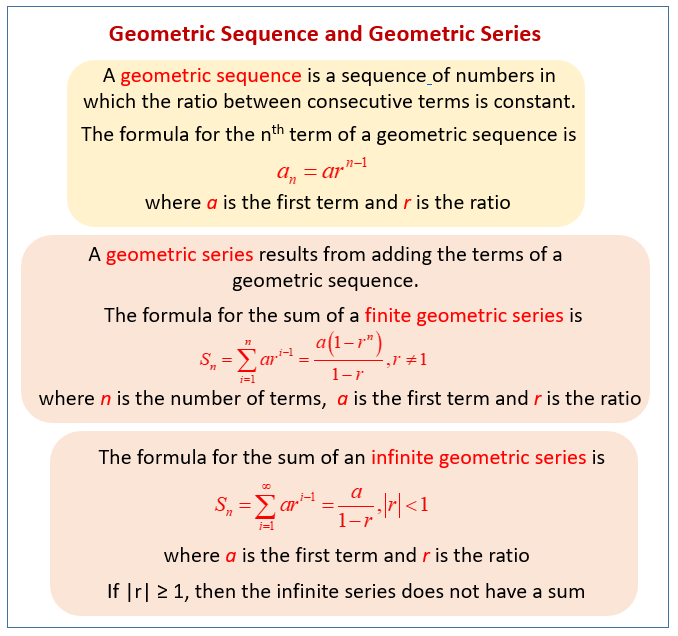 Geometric Sequences: A Formula for the 'n-th' Term. This video derives the formula to find the 'n-th' term of a geometric sequence by considering an example and uses the formula to find another term of the sequence. How to find the partial sum of an geometric sequence given the first term, the common ratio and n? How to determine the sum of an infinite geometric series, if the sum exists? How to determine if an infinite geometric series converges or diverges? This video shows how to convert the number 5.1212121212..... into a fraction using geometric series.